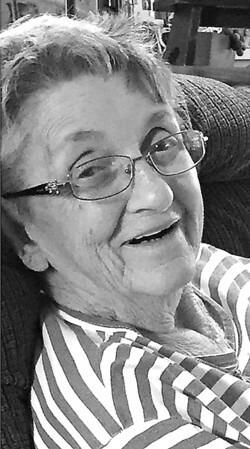 Marjorie Ann (Claffey) DeConti, 84, of New Britain, passed away Monday, July 30, 2018, with her family by her side. Born and raised in New Britain, to the late Patrick and Marguerite (Hogan) Claffey in 1934. She was married to her husband, Philip DeConti Sr. for 66 loving years and they raised seven wonderful children. Marjorie leaves behind 15 grandchildren, nine great-grandchildren, an extended family, several friends and many wonderful memories. A Mass of Christian Burial will be held at St. Jerome Church, 1010 Slater Road., New Britain, Conn., on Thursday, August 2, 2018, at 10 a.m. Burial will follow at St. Mary Cemetery, New Britain. Family and friends are invited to call at the Luddy-Peterson Funeral Home, 205 South Main St., New Britain, Conn., on Wednesday, August 1, 2018, from 5 to 7 p.m., and Thursday morning from 9 to 9:30 a.m. In lieu of flowers, please make charitable donations in Marjorie’s name to St. Jude Children’s Research Hospital: https://www.stjude.org/donate. To see Marjorie’s full obituary, or to leave online condolences, please visit https://www.luddyandpetersonfh.com/. Posted in New Britain Herald, on Monday, 30 July 2018 19:25. Updated: Monday, 30 July 2018 19:27.